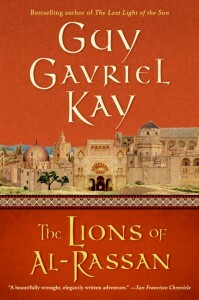 Kay’s next novel was “The Lions of Al-Rassan”. While this was ostensibly another fantasy novel, it arguably is closer to being historical fiction. “A Song for Arbonne” and “Tigana” had taken some inspiration from medieval European culture and history but not to the same extent as “Lions” which takes place in a fantasy world that is almost a literal replica of medieval Europe. The geography and history of Kay’s alternate Europe very closely parallels real history, with occasional differences, and the main religions in the book (which all play a crucial role in the plot) are clearly based on Christianity, Islam and Judaism (their equivalents in the book being the religions of the Jaddite, Asharite and Kindath peoples respectively). The historical setting is the latter stages of the Reconquista, the long struggle by the Christian rulers of Northern Spain to drive out the Muslim Moorish Kingdoms that ruled most of what is now Spain for several centuries. In the book both the Jaddite and Asharite factions are split into several competing Kingdoms, with the Jaddites seeking to overcome their differences to launch a concerted attack against the Asharite Kingdoms. The Asharites are vulnerable after the recent splintering of their nation of Al-Rassan after the assassination of the last Kaliph, and are forced to consider making an alliance with the more fundamentalist Asharite tribes of Kay’s equivalent of North Africa. Meanwhile, the Kindath are stuck in the middle, they are reasonably happy living under Asharite rule and fear the anti-Kindath sentiments of many of the Jaddites. The story focuses on three main characters – one from each of the main religious groups. Rodrigo Belmonte is one of the Jaddite’s most respected military leaders, known as the Scourge of Al-Rassan. A hard but honourable man, he would prefer to retire to his farm with his young family, but his persistence in questioning the circumstances of the mysterious death of the last King of Valledo and a military clash with a rival Jaddite noble who was conducting an illegal raid on an Asharite Kingdom lead to him being exiled. Ammar ibn Khairen is a warrior, poet and political adviser to the Asharite Kings of Cartada. He is also the man who assassinated the last Kaliph and he too finds himself exiled despite being the mentor of the new King of Cartada – a man he put on the throne. The third main character is Jehane, a female Kindath physician who is also forced to flee her home after sheltering one of her patients from execution by the new King of Cartada. Soon, all three characters find themselves in the Kingdom of Ragosa, the most liberal of the Asharite Kingdoms where all the various people of the peninsula live together in relative harmony. Both Rodrigo and Ammar find themselves working together as mercenary captains for the King of Ragosa. Both men like and respect the other, but they know they are both rivals – both have a romantic interest in Jehane and both know that while they may be fighting together now they will eventually end up leading opposing sides in the inevitable war between the Asharites and Jaddites. The Lions of Al-Rassan is a novel driven more by character and setting than by plot. The plot is primarily a device to explore the differing cultures of the peninsula (and how those cultures interact) and to explore the various characters. Rodrigo and Ammar are intriguing, charismatic characters. Both are likeable but ruthless, complex and believable and both very alike in many ways even though they come from completely different cultures. Jehane is an equally strong character, an independent woman caught between two cultures and between the two main male characters and trying to figure out which side she belongs with. The supporting characters are also varied, interesting and well-characterised. There is a great deal of historical detail here as well, much of it taken from real history with just a few fantasy additions. The description of the setting never involves dull exposition; instead Kay manages to portray a vivid picture of his competing cultures without the background detail ever getting in the way of the story. The clash-of-civilisations plot is interesting and compelling (particularly as Kay refuses to favour either side) and the subplots are entertaining, although it is a slight disappointment that although we see a lot of the build-up there is very little of the actual Reconquista itself. The prose and dialogue is of a consistently high quality, entertaining and often poetic and the occasional inclusion of Ammar’s poems show that Kay is a good enough poet for their inclusion not to feel like an indulgence. In summary, despite the fantasy tag this is closer to being historical fiction with a few minor fantasy elements added. The genre is largely irrelevant when the writing and characterisation is as good as this. Perhaps the plot isn’t quite as focused or compelling as in Tigana or A Song for Arbonne, but this is still an excellent book.